Coating is one of the most common treatments performed on gemstones, especially on colourless materials such as rock crystal and topaz. Iridescent coating has become particularly popular among jewelers, designers, and consumers alike. 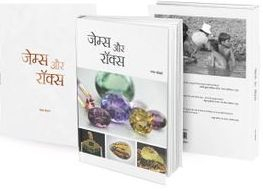 In addition to this advanced coating method, traditional forms still exist, not only to create unusual material but also to imitate well-known gems such as emerald, rubellite or like. There are numerous artificial, treated and natural materials prevail in the market place which can imitate an emerald quite convincingly. 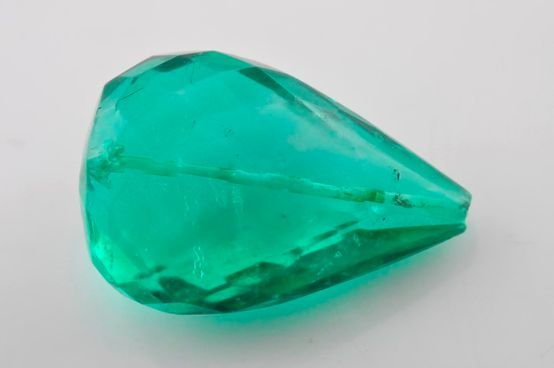 This report describes a green drilled briolette (figure 1) weighing 73.58 carats and measuring 34.10 x 23.14 x 15.68 mm, which was brought to the Gem Testing Laboratory, Jaipur for identification. The depositor of the stone was very much certain that the specimen was an emerald of Colombian origin. Initial glimpse of the specimen suggested the depositor’s confidence justified, because of its characteristic green colour, however just at the second moment we held back because of its relatively duller lustre. Therefore, before conducting any other test, we directly used the microscope, since we were anticipating a natural emerald of Colombian origin! If such would have been the case, microscope alone was enough to conclude the specimen as natural emerald. As placed under the microscope, some elongated two-phase inclusions and reflecting liquid films became quite obvious. Such inclusion scene is not usually associated with emeralds of Colombian origin. 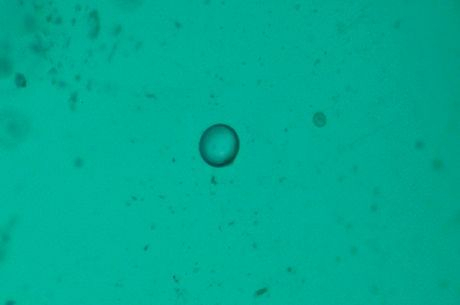 In addition, some gas bubbles (figure 2) were revealed which mainly restricted to / near the surface of the sample. On careful examination, a thick layer was observed and all the gas bubbles were restricted within this layer. 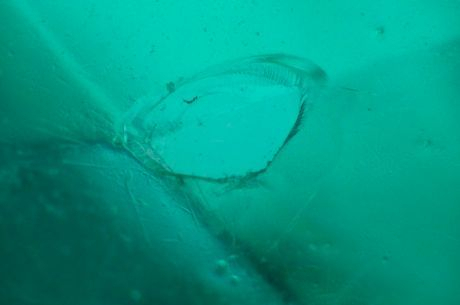 Figure 3: Chipped off corners of the sample in figure 1 revealed the underneath colourless area, which was identified as rock crystal. Magnified 45x. When viewed at the corners of the drill hole, colourless underneath areas were revealed with a thick layer of green colour (figure 3). This also became evident at few of the chipped off corners of the facets. When tested with a hot point at an inconspicuous area, it showed signs of melting; this indicated the coated material being plastic. This justified the duller lustre of the sample. Further, gemological tests were performed to identify the nature of the base material. RI and SG readings were immaterial in this case, however, were measured for records. Vague shadow edge was seen at around 1.54, while hydrostatic SG was measured at 2.60. It gave a chalky yellow reaction under long-wave ultra violet, weak red under Chelsea filter and displayed a strong band in the red region at around 650nm which is typically associated with green dye. The purplish pink sample (figure 4), fashioned as a tumbled bead, weighed 22.99 ct and measured approximately 21.41 x 15.39 x 11.29 mm. The bead’s colour initially suggested rubellite tourmaline, but its relatively dull lustre raised some suspicion of a coating. To the unaided eye, no features associated with coating were visible. We then viewed it with a microscope, particularly around the drill hole, which is the best place to find chipped-off areas in a coated specimen. No chipping was seen; rather, some abrasions typical of natural stones were observed (figure 5). These features seemed to eliminate the possibility of a coating. However, the bead did display some large internal films with a brownish epigenetic appearance, and it lacked the growth tubes and liquid reflecting films typically associated with tourmaline (although some crystalline and fluid inclusions were present). These observations prompted us to conduct further testing. The stone displayed a vague shadow edge at ~1.54 on the refractometer and had a hydrostatic SG of 2.60. It gave a weak orange reaction to short-wave UV radiation and was inert to long-wave UV. With the desk-model spectroscope, it displayed two strong bands in the yellow and red regions at ~580 and 650 nm; a weaker band was also visible at ~540 nm in the green region. This absorption pattern is associated with red and blue dyes, and the combination of gemological properties ruled out tourmaline and suggested artificially coloured quartz instead. Further microscopic examination with transmitted light revealed colour bleeding and blotchiness near some pits and cavities (figure 6, left), evidence of surface-related artificial colouration. Also seen were some tiny blue and orangy red spots from the dye (figure 6, right) indicating that a combination of these colours was used to produce the purplish pink coating substance. These coloured spots appeared to be confined to the surface, another sign of coating. Figure 6: A few surface cavities on the coated quartz displayed colour bleeding and blotchiness, suggesting surface-related artificial colouration (left, magnified 45x). Also present were some orangy red and blue spots from the dye, an indication that these colours were used in the purplish pink coating (right, 60x). The RI and SG alone could not be used to identify the colourless base material but was surely of some help as it assisted to narrow down some possible options. Conclusion was however drawn on the basis of infra red spectra associated with quartz (rock crystal). Therefore, these specimens which were submitted as emerald and rubellite were identified as coated rock crystal. In the absence of gemological tools / testing, correct identification of this sample would have been a problem, especially for a trader or dealer as he is mostly equipped only with a hand lens and they have to make quick buying decisions.